Released on February 4th, 1977, Rumours became one of the biggest-selling albums of all time, and made Fleetwood Mac a household name. 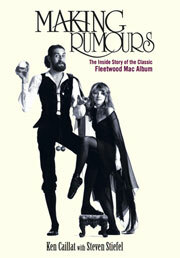 It's now the 35th Anniversary of the album release, and Ken Caillat's new book MAKING RUMOURS: The Inside Story of the Classic Fleetwood Mac Album tells the story from his perspective, of what really went into the making of this legendary album that was to become one of the biggest selling and most influential rock albums of all time. The book takes readers behind the scenes in the Sausalito, CA recording studio and documents the making of what would come to be 1977's GRAMMY Album of the Year. Ken recalls experiences from an era of excess that included endless partying, relationship dramas and creative struggles, while writing and recording classic tracks like You Make Loving Fun, Don't Stop, Go Your Own Way, The Chain, among others. Hear Caillat in discussion, along with Vice President of the GRAMMY Foundation and MusiCares Scott Goldman as moderator, talk about the making of both the album and the book. Following the interview, Caillat will take questions from the audience and will sign copies of his book.